DoctorOfSpace, if there's anything we're really approaching it's another major war, everything else is just a big advertisement campaign and not really relevant to civilization development. Some people, sure, will reason that this is the only way the Universe works, but they don't seem to take in account the possibility that it's their ideas that can actually influence the reality in non-intended ways, they don't look back trying to prevent repeating of the history of 20th century. Such philosophers, apparently, place themselves beyond responsibility. It is possible but I highly doubt it. You may have a negative view on such things because of the actions currently being taken by the Russian government but I doubt even Russia would be stupid enough to start a global conflict. You could potentially bring up China, but China's economy is so intermingled with the global economy that starting any sort of major conflict would cause widespread economic and social problems. Globalization so far made sure that global wars are not a good idea. There also isn't really any real military currently on Earth, by itself, that could win a war against the US. The US military is decades ahead in research, funding, and applied sciences. This doesn't even include the joint operations between the US and other nations. Anyone thinking about starting a war would be making a very foolish decision and would simply be harming themselves. This doesn't mean there won't be conflicts, the world is full of inequality and social problems, but I don't think any sort of major global conflict between nations will happen. everything else is just a big advertisement campaign and not really relevant to civilization development. Where I live I see the future everyday. I see electric cars, solar panels being put on homes, robots delivering things in hospitals and hotels, self driving cars, Baxter robots working in packaging facilities, new nanotech materials being used in desalination experiments, and even see people running with robotic legs and using myoelectric robotic arms. I do not live in a low income area which is why this sort of thing is being done here, but as these technologies progress they will become more widespread, just like computers, cellphones, and the internet. The next couple decades will most likely cause large scale economic problems due to advances in automation, this is not advertising or irrelevant it is a world changing advance that is happening today. I won't presume to know the state of affairs in Russia or other countries, but these things do exist here in the United States and they will change the world. You may have a negative view on such things because of the actions currently being taken by the Russian government but I doubt even Russia would be stupid enough to start a global conflict. This is also one of the more definite ways to say that something is going wrong - the implication that only some countries are doing something wrong, statement that put the blame on concrete factions, rather than sharing responsibility between all members of UN. This is probably the closest point you can get before sinking into the psychology of global standoff. Some people are still living in delusions provided by their conservative views on reality, as if nothing has changed since turn of the millennium, but they don't realize how fragile their reality is. Only five years ago no one probably anticipated such situation as we are facing today, and this pains me a great deal all this time because we could have prevented it even back then. I couldn't possibly agree less to that statement, every now and then my life has some improvements beside the facts that are displayed through television and Internet, but in the same time, I see all the contradictions that emerge through these signs of future coming. There are possibilities that couldn't probably frighten less than atrocities of last century, but I already see that people learned nothing from them, and I also see why this is happened - unfortunately there's not enough time left to prevent history from repeating itself all over. Machines may possibly free a lot of people of their jobs, but in the end it might as well contribute a great amount of manpower to armies of factions that wish to rule through violence, not peace. There's a brilliant movie called "Home" addressing a great deal of environmental problems, but at the end of it there is a part that tries to convince people that situation isn't that bad and there are programs to coupe with these issues, but even they are having fatal flaws are now obvious to me. But compared to overall problem these are just the tip of the iceberg, as people never remember about underlying questions. I am not a pessimist, I want to be a person with cold mind, warm heart and clean hands, there's a severe lack of people of these qualities in the world. I myself may not be qualified for this role, but I know that there's a lot of people who lived through war and peace and are totally ignored by general public. Machines may possibly free a lot of people of their jobs, but in the end it might as well contribute a great amount of manpower to armies of factions that wish to rule through violence, not peace. Machines for war is an inevitability. but at the end of it there is a part that tries to convince people that situation isn't that bad and there are programs to coupe with these issues, but even they are having fatal flaws are now obvious to me. My own assumption is that through biotech, nanotech, and advances in AI we will be able to solve most, if not all, of the issues we currently face. There is no guarantee that we will survive this century or make the right advances, but I remain optimistic. The number and spread of conflicts is on the rise, the system of international relationships is crumbling, the economy is struggling under unbearable load and ignorance is achieving astronomical proportions. Of course, the years before never really pleased us with absence of war, and conflict, and grief, so the news from late-cold war ain't really changed since, but it's not about the news. In fact that is exactly why news are made - if you want to look for the core of the problem you have to be critical, not just optimistic. Machines for war is a reality, people who go to war is inevitability. People who are driven by money and greed won't stop before anything, they will destroy your environment when you are looking for wonders that don't really even close to reality. Just think of the expert systems that are capable not to improve the quality of services, but provoke technological emergencies. Or agencies that don't try to fix the issues in the society but rather divide it and force them fight each other. Or engineered viruses and diseases, or computer programs that target specific sectors of industry. Or maybe near 100% surveillance coverage in the world. These may not be the everyday realities as of yet, but we are pretty close to them, and people are getting excited about that? No, they must be ignoring it because it's not in their interest to do that in the first place - these aren't just magic words like "nanotech, biotech and AI". My own assumption is that through biotech, nanotech, and advances in AI we will be able to solve most, if not all, of the issues we currently face. It turns out people don't really learn much from their predecessors when it comes to evaluating the future. People who will survive next 20 years will look at their elder generation with sorrow and leniency. Engines fueled with gasoline, machine guns, radio communication indeed solved some of the problems, but they can't compare to amount of problems their misuse produced, and the first thing they've been tested on are actually real wars. Now if you compare the amount of problems that can emerge due to complexity of modern society, the fear of global thermonuclear war will become pale compared to other more real possibilities. All the time I spend in English-speaking Internet all I hear from every direction is the same thing. "Stupid Africans, they did ebola", "stupid Japs, they did their nuclear catastrophe", "stupid islamists, let them shoot themselves", "stupid Chinese government", "stupid Russian government". Every problem so-called "international community" may pass on to someone else's shoulders they will, every benefit they may extract form these problems, they'll try. This is not kind of globalisation most of the people are looking for, and you can't solve these problems by ignoring them or leaving them up to technological progress, driven by the forces of divine providence or the invisible hand. Technology and human actions must go hand in hand for the development of civilization. The modern world exists because of industrialization, but whether technology will be used for peaceful or violent purposes is determined by the class that controls it; the class which is in power. So long as there is an aristocracy which gets its power from people in classes below, there will be conflict, since their interests are at odds, and yet they depend on each other for the current system to survive. Whether humanity destroys itself is an irrelevant question, since WWII made it clear to world powers that direct conflict will result in complete destruction. That's why all major world conflicts today are fought in proxy wars. The only way there will be another world war is if a country completely forgets that, which is not a realistic expectation. 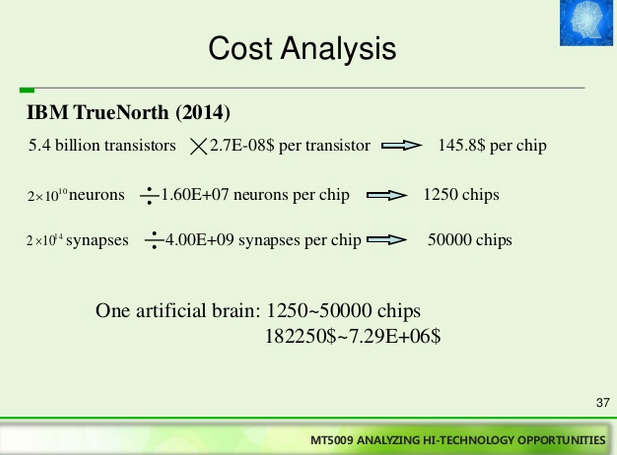 Jeff Funk, Associate Professor at National University of Singapore, makes some projections and analysis of Neuromorphic chips. 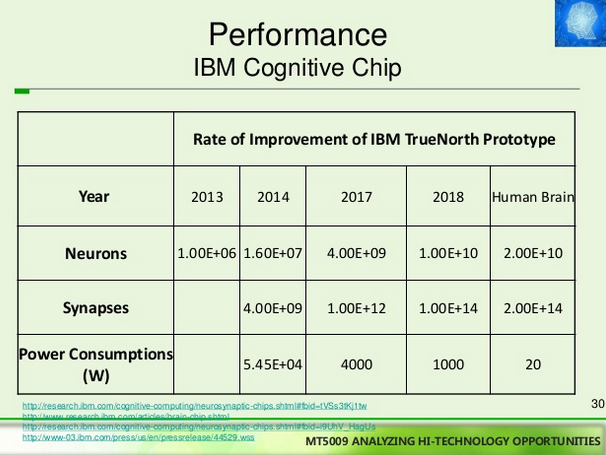 The presentation describes the advantages and disadvantages of synaptic chips when compared to conventional chips and how rapid rates of progress in speed, density, and power efficiency are making synaptic chips economically feasible for supercomputing applications. 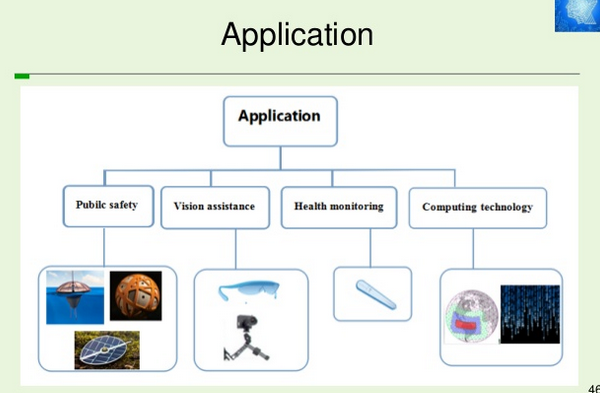 The biggest disadvantage for synaptic chips is in software; a new operating system and application software are needed. Jeff believes there will be applications for image recognition and visual assistance for the blind and for improved health monitoring. on Aug. 17 that the team working on the brain chips recently hit a new milestone—a system has about 48 million digital neurons, which is roughly as many as found in the brain of a rodent. IBM Research today announced a major engineering breakthrough that could accelerate carbon nanotubes replacing silicon transistors to power future computing technologies. 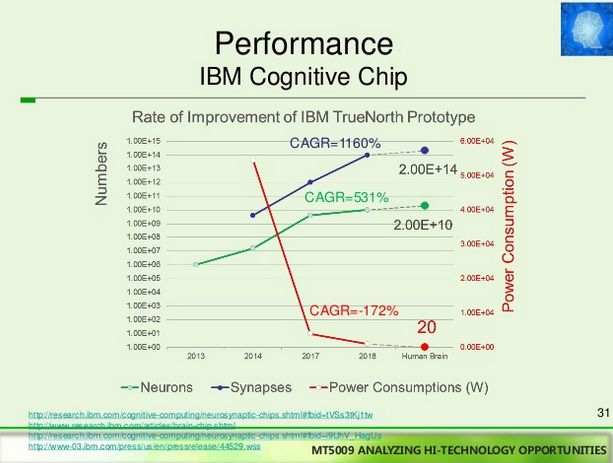 IBM scientists demonstrated a new way to shrink transistor contacts without reducing performance of carbon nanotube devices, opening a pathway to dramatically faster, smaller and more powerful computer chips beyond the capabilities of traditional semiconductors. The results will be reported in the October 2 issue of Science. Which is not even feasible because of inflation values of dollar and drop in purchasing power. Even if they are true (it is a big question in itself because these numbers are being supervised by the same World Bank), the inflation since 1990 is at least 87%, which means that actual "extreme poverty" level have risen since that year from 1.25$ to 2.33$.